PAULA WHITE: IS SHE, OR ISN'T SHE? 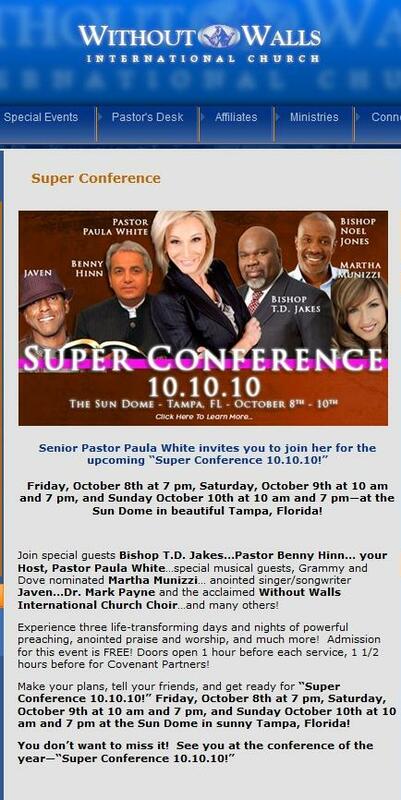 A couple of weeks ago in Paula White Hawks Her Upcoming Super Conference With Heretics-Я-Us , here at Apprising Ministries, I told you about something that “life coach, author, motivational speaker” Paula White—now billed as Senior Pastor—is/was hosting something called Super Conference 10.10.10 (SC 10). Now the video below will tell you to pastrix Paula White’s website for “more information”; but interestingly enough, on the heels of rumors concerning Benny Hinn And Paula White Side By Side—as in a possible romantic affair—if you were to go right now you’ll not find any reference to this SC 10. Which now begs the question concerning Paula White: Is she, or isn’t she going to feature her “friend,” and fellow Word Faith heretic, Benny Hinn at SC 10? As for right now, only seducing spirits around her know for sure. RELATIONSHIP CLOSER TO PAULA WHITE THAN JESUS FOR BENNY HINN?